• What Came You Here to Do? Of here chyldryn after here [g]yndynge. Bothe wel and onestlyche, ful sycurly. For the moste oneste craft of alle. Thys onest craft he putte hem to. He schulde have more worschepe then the lasse. Hys name hyt spradde ful wondur wyde. And love togeder as syster and brothur. For cause they come of ladyes burthe. Thys craft of gemetry yn Egypte londe. An to worschepe hys God with alle hys my[g]th. By good consel, [g]ef hyt myt[g]th falle. To ordeyne for these masonus astate. And fyftene poyntys they wro[g]ton. Thy worschep, thy profyt, hyt shcal be most. To that semblé withoute fabulle. As [g]e mowe knowe by good resowne. May fache the prentes whersever he go. That hyt mygth greve summe or alle. Take a prentes of herre degre. Toke thys gemetry, that ys ful good. Schulde do the craft but lytul good. Also muche as hys felows don, yn alle vyse. So ys not he, [g]e mowe sen hyt. To take hys, hure as hys felows don. Thenne hys felows, that ben ful perfyt. Hys hure may ful wel amende. Schal no thef nowther clothe ny fede. Lest hyt wolde turne the craft to schame. And take for hym a perfytur mon. My[g]th do the craft schert worschepe. That hyt nowther fle ny grake. That longuth to a maystur mason. Ther schal no mason medul withalle. To brynge the werke to ful good ende. [G]ef that y cowthe amende hytte. Bytwynne [g]ow bothe withoute nay. Whersever he go undur the sonne. Of hym dyvers poyntes may lurne. And hymself to mechul blame. For that they craft wol that thou do. Wel deserve to have hys mede. And brynge the craft ynto gret schame. [G]et he wolde have the same lawe. [G]ef he thenke wel for to thryve. Ofte aryseth ful gret debate. That they stonde wel yn Goddes lawe. No more thou woldest he dede by thyne. For suche a fowle dedely synne. To both partyes, and that ys good ry[g]th. Any brynge thyself ynto gret blame. Whenne thy felows wollen that thou do. May make the craft kachone blame. Do hym no favour thenne securly. That was y-fownded by olde dawe. With swete wordes noresche hym love. That longuth to the craft bothe fayr and fre. Ynto here warde he schal be take. The threnteth poynt ys to us ful luf. Nowther for hys good, ny for hys kyn. To be trwe to hym, over alle thynge. That hath ben ordeynt by ful good lore. And to the semblé let hym be brow[g]ht. Of grete lordes and masonus al y-fere. And swere hyt never more for to use. Tyl hyt be oure lege kynges wylle. Yn what place they schul semble to. Alle the men of craft tehr they most ben. [G]ef that eny of hem ben thenne y-broke. That y have by my dygnyté. Gravers and ymage-makers they were also. To turne the pepul from Crystus lawe. And weren yn hys serves ever more. An beyleve on hys falsse lay. The more yoye wes to hem of Cristus grace. The name of quatour coronatorum. After Alle Halwen the eyght day. Seven myle the he[g]ghte schadweth the sonne. That never won wyste what other schuld reche. Of dyvers craftes mony mo. That con deperte falshed from trewthe y-wys. Whose useth hem wel, he may han heven. And to good norter, whersever [g]e com. Thenne [g]e fynden hyr y-wryten. To pray and wepe for here synne. With all thy wyttes, and eke thy my[g]th. Qwenchet a venyal synne, be thou ser. For hyse love that dyed on the rode. In heven blysse to hav a place. Latte non other mon by no way. Yn forme of bred, as y the se. Amen! amen! so mot hyt be! Now, swete lady, pray for me." When thou knelust at the sakerynge. Wol kepe hem to the ful welle. That yn churche ther don yse. Thyn owne worschepe tou save so. Tyl thou have leve hyt on to do. Yn hys face lovely thou loke. By privy avoydans let hyt go. Thou hast gret nede to governe the welle. That ys norther good and clene. Forsothe, good norter wol save thy state. Gode maneres maken a mon. But [g]ef that thou do hem know. Ry[g]th as hyt may be ther y-ete. [G]ef thou sytte by a worththyur mon. [G]er thyself to hyt reche. When thou begynnyst to drynke or speke. Whether he drynke wyn other ale. And kepe the wel from “had-y-wyste." Ny make no ragynge with rybody. With hyt thou myght thy selven spylle. Do hym revera(n)s after hys state. Nowther at the wyn, ny at the ale. Heven to have for [g]owre mede. Say we so all per charyté. That they stand well in G-d’s law. Through false slander of such fame. That belongeth to the craft both fair and free. The names of the quatuor coronatorum. After Halloween the eighth day. That never one knew what the other should tell. That can separate falsehood from truth, I know. Now sweet lady pray for me." When thou beginnest to drink or speak. And keep thee well from “had I known". Do him reverence after his state. or are you satisfied to be the kind that “just belong”? or leave the work to just a few and talk about the clique? and we’ll appreciate if you, too, would come and help us out. So come to the meetings often and help with hand and heart. Don’t be just a member, but take an active part. Think this over, member; you know right from wrong. Are you an active member, or do you just belong? Inside—“Brother”, an’ it doesn’t do no ’arm. Of the God ’e knew the best. Changin’ pickets in our ’ead. and then it was opened wide. as I slowly passed inside. for the Brethren all to see. than the organ’s solemn sound. as I struggled not to sway. for my naked breast to feel. though wishing that I could see. my sight was restored to me. and felt the Mason’s token. as a Mason, from the start. or reach the highest station. Great Overseer I make my prayer. I know, through Thee, the blame is mine. And Manlike stand with God again. Thou knowest Who hast made the Clay! I saw naught common on Thy earth. and each degree requires him on bended knees. that our trestle board represents our deity. during lodge openings from beginning to end. may we always remember to put him first. remembering each degree and associated fears. how to be a good Mason from day to day. Entered Apprentice: the first degree. How to wear my apron was explained to me. we were taught how to kneel; we were taught how to stand. we gained additional knowledge, we received more sight. the square of morality and virtue, a very large part. Master Mason, Third Degree: the one that’s truly sublime. Symbolically we’ve had many trials, and we’re almost out of time. to seek our rewards of fidelity from our great Grand Master on high. One listened to a rumour, then there were nine. One didn’t like the “Master,” then there were eight. One joined too many clubs, then there were seven. Had a dispute, then there were four. One didn’t like the programs, then there were three. One got too tired, then there were two. One said “What’s the use?” and then there was one. Talked so much about it, they numbered sixteen. Were pleased when their ranks swelled to thirty-two. It’s our fault if we harm the Lodge we adore. And keep your obligation well by serving the very least. today, I search each one apart. I’m looking for my brother. By square and compass, Brother now! all were taken on bended knee. darkness to light, now I see. about the first degree I took. how I was nervous and shook. once blindfolded and in the dark. my conductor held me tight. square corners to my right. and a sweet prayer filled the air. I’m asked to promise and swear. many brethren were there for me. but it was just the first of three. about the second degree I took. a little nervous, but not shook. twice blindfolded and in the dark. but patiently waiting to embark. this being the second one of three. about the third degree I took. not even nervous nor shook. thrice blindfolded and in the dark. the last and final one of three. a Master Mason I’m not yet. once again I start to sweat. retracing the steps of others. they appeared to be brothers. but meeting them I don’t regret. meeting him, I will never forget. a sign, a step, and a token. and others never to be spoken. what came you here to do? and perform your allotted part? or motive personal in view? of the symbols of our chart? and make improvements in your art? And the Brotherhood of man? When life surges fierce and wild? To the Mason’s widow, wife, and child? and can give a correct answer. and purity of the heart. a journey about to start. this was the first time worn. proudly tied about the waist. proving to be moral and chaste. with deity always in thought. a Fellowcraft is thus taught. always tied steadfast and right. and dons it this way evermore. worn square, level and plumb. for centuries past and to come. An easier road because of us. We build for all mankind. Shall find the road we build today. May toil with singing heart. the BUILDER for his faithfulness. it was hard, rough, and cold. only square work I was told. the Overseers were on guard. in quarries where I laboured hard. and I went to collect my pay. and I was abruptly taken away. then they all started to roil. and then all returned to toil. as I continued on my piece. hearing the words, true work. after another glance, good work. this time was not a disaster. now, I am a Mark Master. His hand upon your shoulder in a friendly sort of o’ way. When his hand is on your shoulder in a friendly sort o’ way. With its cares and bitter crosses, but a good world, after all. When a hand is on my shoulder in a friendly sort o’ way. I’ve gained a new composure. with fellowship and brotherly love. from the Supreme Ruler above. passing through the tyler’s door. now in the West I can be found. for ‘tis there that I am bound. the lodge will be in my care. and sitting in the Oriental Chair. what Freemasonry means to me. that a better man I might be. As Fellow Craftsmen – no more and no less. Because he is not what he hasn’t been born. No one is safe from the dog-whips’ reach. Solomon’s mandate: “Forget these things! Companion of Princes – forget these things! of the many whom you passed? over what you did and said? Did you waste the day or lose it? Was it well or poorly spent? by the work you did today.”? that one they call the Masons. are wrong – unjust – unfair. no lodge have been inside. in this world, far and wide. at things said by the crowd. Take heart; stand firm; be proud. And - which is more - you’ll be a Man my son! There’s open house for you! The true life of the wine! The very best for you! The waters thick with sand! Around the corner! Yet miles away . . .
but a better man he’d become. the square, level, and plumb. apron clad Freemasons on display. will remember his good deeds. they all wish him Godspeed. the earthly bonds now broken. this craftsman is set to hasten. A father’s love is gentle, wise and kind. He helps to ease your fears and to clear your mind. He chases away the monsters in your bad dreams. His strength shows you that it’s not as bad as it seems. He’s a shoulder to cry on when you’re feeling low. He can give you a hug and a smile that warms your weary soul. Always giving, freely, of his time. To put your care and well being first in his life. To ease your life from worry and strife. A father’s love is endless. He’s a light in the darkness. He’s a source of information and advise when something has gone wrong. He helps you to figure out the puzzle of your life. Putting the pieces where they belong. He’s always, lifting you up and encouraging you to try. With him by your side, you can do anything. Even soar into the highest sky. Giving tender, loving care when you are sick and in need. Waiting on you, hand and foot. He watches over you through the night, with a vigilance unsurpassed. And you know, without a doubt, for you, his love will last. Making personal sacrifices that his family can have the best. Keeping food on the table and under a roof in which to rest. Taking care of those he holds most dear. Being there to laugh with them. There to wipe away their tears. There’s nothing like a father’s love. You wouldn’t find anything that comes close. Even if you went to the, most far away star. His love is like the father’s love. And just like the father, he will never leave you. Give him honour and respect he deserves, each and every day you live. He’s a treasure to be cherished and to him we must give. All of our love and devotion in return. For in the presence of our hearts, his love will burn. For no other place on earth will you find peace from all harm. Nowhere else, but the shelter of a father’s arms. Make sure you tell him everyday that you love him so. Because, one day, home to the Father he’ll go. For God the Father has given him love to share in words and deeds. And I’m so glad that he has shared that love with me. Who sit alone while we’re away. While sitting at home alone at night. I am God’s wonderful library. I am always and above all The Truth. To the one who sits in gloom, I am a glorious light. To those who stoop beneath heavy burden, I am sweet rest. To him who has lost his way, I am a safe guide. To those who have been hurt by sin, I am healing balm. To those who are distressed by the storms of life, I am an anchor. To those who suffer in lonely solitude, I am a cool, soft hand resting on a fevered brow. is where they can be found. that will impress and astound. to which you’ll have an affection. of the Princes of Jerusalem. of Cyrus’ and Darius’ Kingdom. known as the Rose Croix. of hope, truth, and joy. are those of the Consistory. rounding out a complete history. with an open and inquisitive mind. the trials and tribulations of mankind. and you’re ready to pursue. is here and waiting for you. I found what governments hide. The figure head is dead, the mouthpiece lied. I know what they mean; when they say thirteen! three knocks on the door and I’m out. “I see you’re a Mason!” the Tyler relayed. The Master replied, ‘Let’s allow him - but wait! Sung to George Frederick Root’s tune for J. P. Johnson’s 1865 lyrics, The Liberty Bird, the chanters of St. Bernard Commandery No. 35 premiered the song at the 1886 Triennial Conclave in Saint Louis, Missouri. Click here to view a copy of the 4-page song booklet from that event>. The call to the Crusades incessantly rung. Save a rope-knotted gown; it was old St. Bernard. Stands a shelter that’s named for the Monk St. Bernard. And care for the helpless, will our St. Bernard. 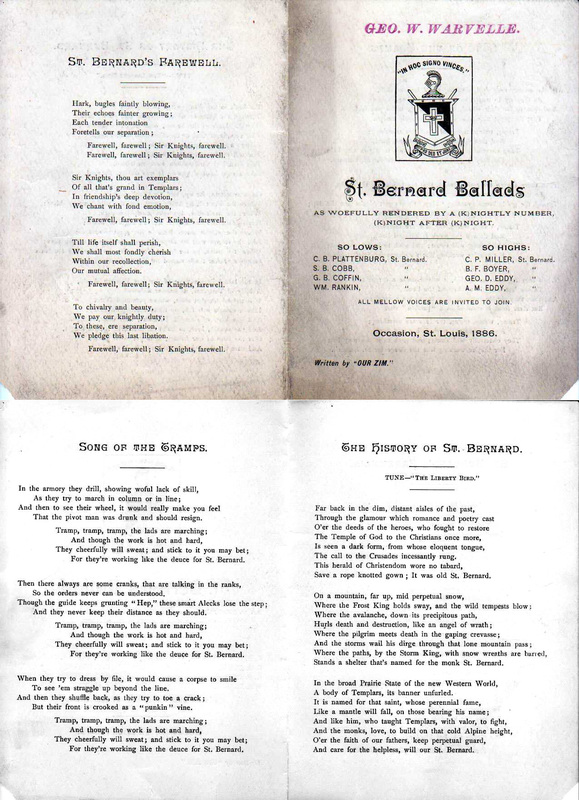 The chanters of St. Bernard Commandery No. 35 premiered the song at the 1886 Triennial Conclave in Saint Louis, Missouri. Click here to view a copy of the 4-page song booklet from that event>. That the pivot man was drunk and should resign. For they're working like the deuce for St. Bernard. And they never keep their distance as they should. But their front is crooked as a “punkin” vine. Farewell, farewell; Sir Knights, farewell. We pledge this last libation. Published in Templar Correspondence, 1901. And has won a victory. And his banner waved on high. They bear a bright red cross. Brought lovingly did him greet. You're welcome here, thrice welcome, knights! For your fame's well-known to all. How they ran and chased each other, as they do most every day. For they were warped and twisted, and always pained a bit. And she would stand and watch them play until the last was gone. But birth defects were her life’s woes, no attempt to correct them was made. Her parents were out of money, and the doctor must be paid. But begged to go to the Christmas Parade, to see if Santa was about. Her family was willing to take her, to give her a little treat. It was a thrill for a little girl, when she stood there on the street. Then here they came, the big brass band, the clowns and animals too. The motorcycles and funny cars, it thrilled her through and through. Her hands were gripping her crutches, but the cheer was in her face. You could tell the cold was unnoticed, as she stood there in her place. As they tossed the candy and bubble gum, they caught the watchers eye. To greet the girl with crutches, his sympathy he could not hide. She knew the Fez and who they were, an angel was his find. He never forgot the meeting that day, the smile that Christy showed. How she stood there on those crutches, and how her face had glowed. Days had passed, but he never forgot, those legs didn’t match that smile. He had to help her if he could, if it took him a little while. Where again he would see Miss Christy, a second time they would meet. Now Christy stood by the window sill, as he came up the slight incline. She yelled for mother to come and see, it was her “Mr. Shrine”. And how he’d gotten an interview, and he wanted the family to hear. The plans were made for Christy, to the hospital she would go. There might be several trips to make before they would really know. Once in the van, she asked “Mr. Shrine” – you could see him hide a grin. “No, my dear, that’s over now. Next year we will sell again. But now she stands tall without a crutch, her legs as good as new. she stood there with that same sweet smile, as he wiped his misty eye. “You’re just so good,” she told him, “and doctor I love you much. Then she kissed him on the cheek, and walked out to the van. and she was bright and glowing, just like the warm sunshine. And knew her cure was heaven sent, for soon she would know how. She thanked “Mr. Shrine” so sweetly, and asked if the bill was paid. “Oh, no, my dear, there is no bill, for one was never made. And the money is kept ‘till we need it, by the Treasurer of the Shrine. The trip too soon had ended, and Christy began to cry. but he told her now that she was cured, she could help if she wanted to try. “Tell everyone to buy a paper,” and he waved to her good-bye. For “Mr. Shrine” and the Paper Sale, and for making her well this way. She had started to church one Sunday morn, she saw Shriners everywhere. They were out selling papers, with that same tender, loving care. and as it came her time to pay, there stood her “Mr. Shrine”. For he had made life whole again, from a parade when he passed by. Oh, “Mr. Shrine, I love you so,” as she kissed his aged face. No matter how old she grew to be, in her heart he had a place. Then there in church one thought she had, she knew God wouldn’t mind. by Warren Grimes. Printed in J. Ed. Hart, “Unto the Least of These” A Story of the Shriners’ Hospitals for Crippled Children (Greenville, South Carolina: Board of Governors of the Shriners’ Hospital for Crippled Children, 1948), 6. Thy Kingdom and Thine everlasting reign. by Noble Robert W. Pinkerton (Zenobia Shriners, Northwest Ohio), (1925-1994), courtesy of Masonic Poets Society. to a family down the road. They lived a block or two away. with one in a wheelchair. They’d go for walks and wave to us. for years, we did not know. was born with bones deformed. some tests had been performed. they knew it couldn’t be. was a member of the Shrine. where the Shriners were connected. Today, that boy is seventeen. he now walks like you and me. He plays with kids outside our door. He runs and rides his bike. before, his life was like. from G-d through hands of men. the noble work they’ve done. on this boy … and on the Shrine. Then our prayers have all been answered, no praises need be said. Or by giving of our time and love, show him that we care. Would be reward enough to see sunshine upon that face. For when we give ourselves away, we’ve found life’s mystery. to the great beyond that we never talk about. in the air, no hip spica can keep me down. as the cars pass. Dodge Dart. a world going on, going by, going home. I saw my first parade. Wow; what a bore! Not another fire truck, not an old police car, but a goofy guy in a fez and a beard. “Hey Mom, what is that guy doing?” I did yell. How cool was it for me? I knew of the Shrine but not what they did. Here was The Red Fez Limited, fully festooned with a gorilla that hid. And he was chased by a man with a shiny gold scimitar. Then the gorilla went back to his cage assisted by a noble brother. “They are men of character who enjoy to masquerade. But are instead heroes to some much smaller than them. Who finds it his mission in life to be kind to the kids, starting at zero. Unless the stranger champions the cause of saving children from danger. To help the children thrive and live life without bars. Our hearts are large; our go-karts are small. Those tiny tires keep rolling through many a parade. We are the men riding on, in a noble, high brigade. Remember he is there to raise awareness of our plight; to be nothing more than proud. He is making a difference; to help a child survive, nothing can compare. Parents need not lose hope. Do not fret. Shriners are on call. We will always be there. Big, loud, and proud is what being a Shriner is all about. Helping burned and crippled children is the goal we tout. Help us by throwing us a cheer. Give us a smile. Know why we ride those tiny tires and make this all worthwhile. You proclaim that you’re a Shriner. It’s a sign for man to note. It’s a symbol that your fellows have abiding faith in you. if you’ve really caught the meaning of that little badge you wear. Are you mindful of its splendour? Are you watchful of its fame? Are you careful as you travel, not bring it into shame? That you’ve pledged to do the right thing wheresoever you may be. if you do a wrong act which a Shriner wouldn’t do. By the token you are wearing, you’re expected to be fine. that a gentleman of honour he is known and pledged to be. And if he shall fail that standard by some thoughtless word or whim. All Shriners, wide-world over, shall be put to shame by him. stand out in my mind. that’s part of the shrine. in all of our minds. and the religion we choose. than when we stoop to help a child. is what I get paid. who are crippled or burned, and in a bad way. “Go see a Shriner,” their families are told. “Where are these children?” the Shriner will ask. So, who is this Shriner people keep talking about? Why he’s the guy with the fez, selling stuff when he’s out. a Keystone Kop patch or a hillbilly pin. He’ll sell newspapers, candy, artificial flowers, too. G-d bless our supporters, what would we do without you? he’ll entertain our children and act like a clown. dressed like cowboys and Indians, thank you, Lord, for letting us help. And thank You, G-d, for children healthy and strong. as the parade route gets long. but he must have help from the giver and guidance from G-d above. Shriners Hospitals mend our children, and this is come rain or shine. and a great deal of our off time. please hand him a buck and give him a smile. This shows that everyone cares. you know, the one with the tassel on top. because he just happens to have one more. I nearly threw a fit. Now, it’s up to you to make it true. and f*ck the noble who sh*t in the street and showed his *ss to the weather. and he sh*t in the potentate’s hand! Now that’s a bad duck! an impressive sight when on parade. My word was law; none dare gainsay. My slightest wish; supreme my sway. Time marches on, another day. Another Pote holds magic sway. could see no future in the job. that the lights of Mecca may ever shine. no one else will do for me. There’s something mystic in the things he does. But I’ll solve it, wait and see. I’ve discovered a way to hypnotize him. between my mystic Shriner and me. a rare treasure to find. She is gentle, loving and kind. never wanting anything in return. helping them to learn to live each day. From trouble, you can hide. to pick you up when you’re down. that will turn your gloomy day around. She laughs with you when you’re happy. She cries with you when you’re sad. when everything seems to have gone bad. makes your heart swell with pride. She’s a rare jewel, worth of praise. In gratitude, her name should be raised. but, most of all, she gives him her greatest gift. not in the East or West. and, I’m glad that I’ve found that friend in you. I hold in my hand a little scrap of paper 2½ × 3½ inches in size. It is of no intrinsic worth; not a bond, not a check or receipt for valuables, yet it is my most priceless possession. It is my membership in a Masonic lodge. It tells me that I have entered into a spiritual kinship with my fellow Masons to practice charity in word and deed; to forgive and forget the faults of my brethren; to hush the tongues of scandal and innuendo; to care for the crippled, the hungry, and the sick, and to be fair and just to all mankind. It tells me that my loved ones, my home, and my household are under the protection of every member of this great fraternity, who have sworn to protect and defend mine, as I have sworn to protect and defend theirs. And finally it tells me that when my final exit from the stage of life has been made, there will be gathered around my lifeless body friends and brothers who will recall to mind my virtues, though they be but few, and will forget my faults, though they may be many. It tells me that and a great deal more, this little card, and makes me proud, yet humble, that I can possess this passport into a society of friends and brothers that are numbered in the millions.